This is our review of the high end Krups GVX242 grinder. This is not the cheapest of options with an average price of around £75. 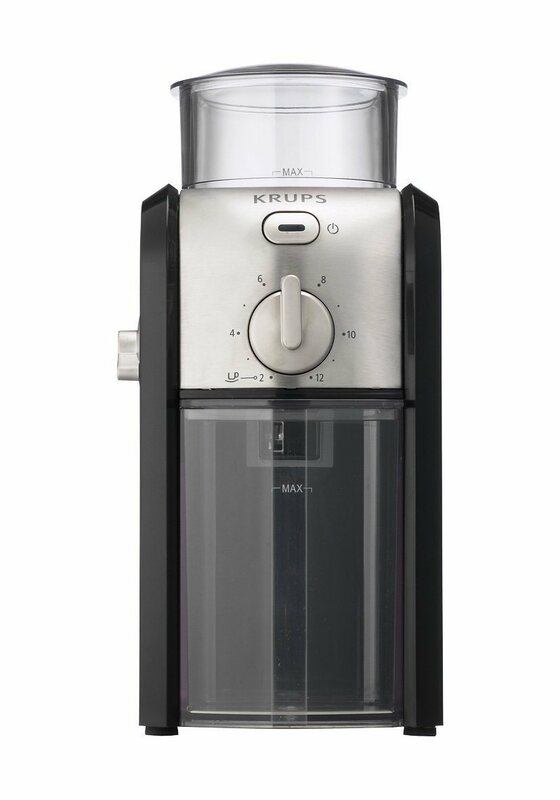 Those who have bought this Krups model, do however rate it very highly indeed. This Krups grinder is classed as a high end grinder. Those who know the important of getting the right grounds of coffee, for various brewing methods, will fully appreciate this combination grinder. I think it is always worth having a look at the product on video. In this video I have fast forwarded the video to the actual review. That should save you a little time and let you see the actual grinder itself. As you can see from the video review above, This is a step up from many of the basic coffee grinders on the market right now. Below we sill start to have a closer look at the important features of the GVX242. The image to the right shows the actual burrs that are inside this machine. They are the most important part of any burr grinder. These particular burrs are very well made. That means they will grind all sizes of grain, and they have been engineered to last. These are professional grade milling burrs, that deliver great results. This is an electric burr grinder which will plug into a normal UK socket. It measures 20 x 16 x 27 cm and weighs just under 2 Kg (Around 4 lbs) It is made from stainless steel, which sits inside a black frame holder. This professional burr grinder has the capacity to grind 200 grams of coffee beans. What makes this model stand out from many others though, is its capability to actually grind beans fine enough, that are suitable for espresso. ​On the front of the grinder is the number of cups setting. This ranges from 1-12 so take your pick from that. As you look at the grinder, the knob to the is the grain setting button. You simply turn the knob to get your preferred coarse of finer grind. Liked the way it could do different grinds, as some people wanted to use it for espresso and others for filtered coffee. The hopper has a clear plastic top which makes things easy to see. I don't question the quality of this model at all. The reviews show that this is a good grinder that does exactly what it is supposed to do. I think the big question for most people will be, do I really want to spend £75 to own this particular Krups model? In my opinion, anyone who wants really find grains for an espresso machine, will probably be prepared to do that. The grinder looks well and is clearly built to last, with a set of highly engineered burrs. The 100 watt motor is certainly powerful enough to drive the burrs. No buyer complained about that being a problem. The brand is also very good, so I would not hesitate to recommend it. One reviewer summed this up nicely when he said, "it is great to put a spoonful of beans in the top, and 30 seconds later, have the exact grind that I want." For this one though, I guess you could say, it does exactly what it is supposed to do.